Sea, Sand & Sky: Finally Fish! 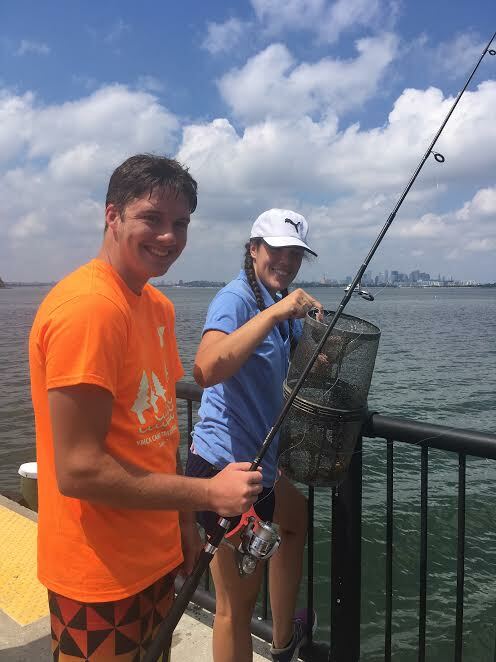 After a crab-filled summer at Spectacle Island, this week finally broke our fishless curse! I was in charge of managing fishing on Thursday when our luck changed. The first group to fish was filled with energetic kids ready for anything to bite the hooks. After just a few minutes, one young man started shouting that he thought he caught something. I ran over to help him reel up a skate! We got the skate up and onto the pier where Kharliyah and Patrice carefully removed the hook from the spiky skate's mouth. A lot of the children did not know what type of fish this was or confused it with a stingray. After everyone had a chance to see our pokey pal, we sent him back into the ocean. 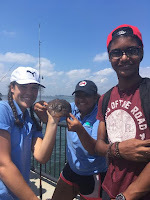 When the next group arrived to fish, I told them they had some big shoes to fill after the previous group's achievements. Within a matter of moments, a camper from Tricklin Falls Camp claimed that he had caught something as well. We expected another fish, but instead we discovered that he caught an old and forgotten crab trap. The trap was filled with a few small green crabs, a tiny spider crab, and even a few little fish! One crab had a baby flounder clutched in his claws. When we removed this crab from the trap, he waived his baby flounder around proudly as if he was showing off his own catch. I managed to free the founder from the crab's grasp and gently plopped it back into the water. 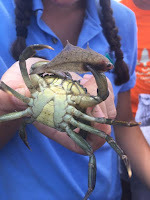 We let the other little fish go and kept the small crabs in the touch tank for other kids to enjoy. After our first two eventful groups, we continued to catch plenty of crabs left and right. At one point, Patrice pulled up a line to reveal that she had snagged a pregnant crab in the process of giving birth! As she was in the middle of releasing her eggs, we quickly let her return to sea to ensure that her babies had a safe delivery. I think this has been my most successful day of fishing ever! 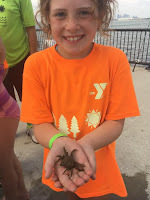 We encountered so many interesting creatures and it really boosted the kids spirits to see that they could find such cool things in the ocean. I hope this is just the beginning of a bountiful summer.